What to Do with Contaminated Water from Fukushima? FILE - A media person wearing a protective suit and a mask looks at the No. 3 reactor building at Tokyo Electric Power Co's (TEPCO) tsunami-damaged Fukushima Dai-ichi nuclear power plant in Okuma, Fukushima Prefecture, Japan, Feb. 10, 2016. Japanese officials are considering what to do with the large amount of poisoned water being stored at the Fukushima Daiichi nuclear power plant. The plant went into meltdown after a 2011 earthquake and tsunami. Huge water storage tanks around the center currently hold an estimated 750,000 tons of water poisoned with a radioactive substance called tritium. People objected last month when news reports said the owner of the center, TEPCO, planned to release the water into the Pacific Ocean. Environmental groups and local fishermen do not want the water released. Takahiro Kimoto is general manager of TEPCO’s nuclear division. He says the company has not yet made a decision. He told VOA that the ocean release was just one possible way to deal with the water. He said vaporizing would be another. “Since there may be an influence on the environment, and because there have been harmful rumors about what effects it may have on people and the environment, we are still consulting with various stakeholders before finally deciding on the solution,” Kimoto said. TEPCO says all nuclear power centers around the world release tritium into the environment. Tritium is considered one of the less dangerous radioactive substances, says Ken Buesseler. He is a marine radiochemist with the Woods Hole Oceanographic Institute in Massachusetts. He is studying the effects of the Fukushima disaster on the Pacific Ocean. Buesseler spoke to VOA by Skype. Buesseler says the timing of how the water is released would make a difference. A system called ALPS is designed to purify, or remove, other more harmful material from the contaminated water. Buesseler says more supervision is needed. Japanese officials also have to remove the nuclear fuel from the damaged power center. 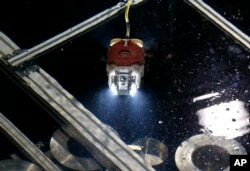 Robots have recorded pictures of what looks like melted fuel rods inside reactor 3. But in other reactors, the very high levels of radioactivity damaged observation robots within minutes. TEPCO’s Kimoto says the company plans to announce a major policy plan in the fall. He says it will also announce at that time what method it will use to remove the fuel. The Japanese government estimates that cleaning the area affected by the meltdown will cost at least $190 billion. Experts predict the process will take at least 40 years. Anne Ball adapted this story for Learning English from several VOA News story. Caty Weaver was the editor. We want to hear from you. Write to us in the Comments Section and visit us on our Facebook page.